This lovely French portiere tapestry "Caroline Pewter" shows flowers and leaf motif in a decorative piece. 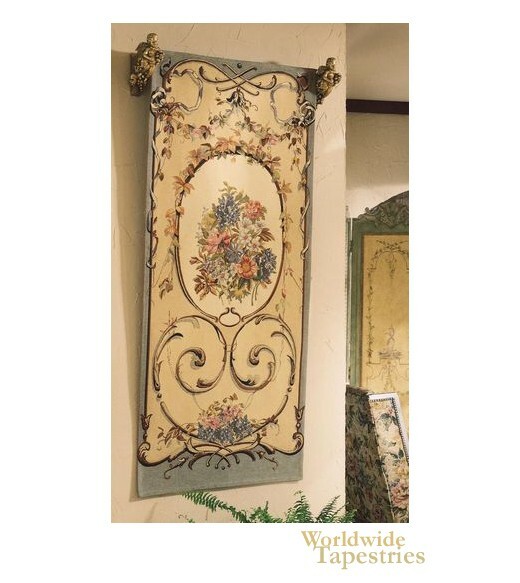 Here we see the French portiere wall hanging in traditional French style, with flowers, and stylish foliage motifs which spiral around the work to produce a decorative effect. The understated style is reminiscent of the original portieres of French castles where royalty commissioned works to decorate royal residences. This art tapestry "Caroline Pewter" is backed with a lining and has a tunnel for easy hanging. Note: tapestry accessories, where pictured, are not included in the price.